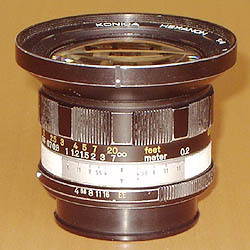 The Konica Hexanon / Hexanon AR 21 mm / F4 is – together with its successor model Hexanon AR 21 mm / F2,8 – the wide angle lens with the shortest focal length in the Konica line-up that still has a corrected image field. 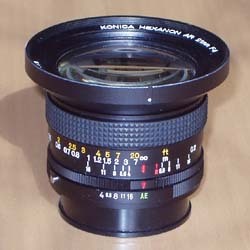 The only Hexanon lens with shorter focal length ist the UC Fish-eye Hexanon AR 15 mm / F2.8, which shows strong perspective distortion as an uncorrected fish-eye lens. With a focal length of 21 mm, the wide angle effect is quite extreme, so breath-taking perspektives and very broad panoramas are possible. 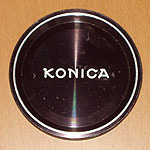 Despite of its exteme focal length, it was available quite early in the Konica lens line-up. 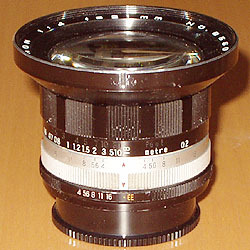 The first variations were contemporary to the Autoreflex T, the 21 mm wide angle lens was available earlier than the Hexanon AR 24 mm / F2.8 with 24 mm focal length. 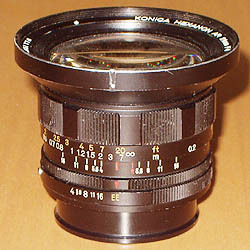 Over the years, it was modernized several times, until it was replaced by its faster and more compact sucessor model Hexanon AR 21 mm / F2.8 during the first half of the 80s. You can find an overview over the variations further below on this page. 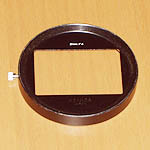 All variations share the extraordinary build quality of the Hexanon lenses from the earlier and middle years.